Mr. Kelly has a point. It is worth remembering that Lee, who has lately been painted as a traitorous caricature, embodied in countless ways the poignancy and tragedy of the Civil War. It would be a gross misfortune if the political debate obscures his story. Lee’s lineage was impeccable. His father was Henry “Light-Horse Harry” Lee III, the celebrated Revolutionary War general and close friend of George Washington. Lee himself descended from two signers of the Declaration of Independence, and his wife, who later became an ardent Confederate, was none other than Mary Custis, a great-granddaughter of Martha Washington and, through adoption, of George Washington himself. Lee agonized over whether to fight for the Confederacy. As war loomed, Abraham Lincoln offered him command of the new Union Army, a position he had always coveted. Despite being an avowed Federalist who longed for compromise to save the Union, Lee, like so many others, gave in to the permanency of birth and blood. 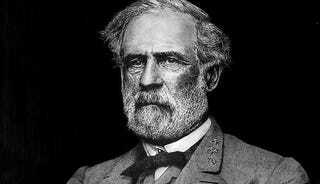 “I cannot raise my hand against my birthplace, my home, my children,” he wrote a friend, “save in defense of my native state.” Instead he became the commanding general of the Confederate armies, while predicting that the country would pass “through a terrible ordeal.” He was right. Nor was he fond of slavery, once describing it as “a moral and political evil.” True, he did benefit from slavery. But in 1863, one day after the Emancipation Proclamation took effect, Lee went a step further than Thomas Jefferson ever did and freed his family slaves, fulfilling the wishes of his father-in-law, George Washington Parke Custis. And in 1865, as the Confederacy stood on the throes of destruction, Lee supported a dramatic measure to put slaves in uniform and train them to fight, which would have effectively emancipated them. Arguably his most powerful statement about race relations came at war’s end in St. Paul’s Church, the congregation of the Richmond elite. To the horror of many of the congregants, a well-dressed black man advanced to take communion, and knelt down at the altar rail. The minister froze, unsure what to do. Lee knelt down next to the black man to partake of the communion with him. Finally, Lee’s greatest legacy was not in war, but in peace. Lee went to great pains to heal the bitterness that cleaved the country after Appomattox. When Lee surrendered to Ulysses S. Grant, in arguably one of the most moving scenes in American history, the military situation remained quite perilous. The war was still raging. Jefferson Davis, the Confederate president, was on the run, calling on Southerners to take to the hills and wage guerrilla warfare. This at a time when there were still three Confederate armies, and hatreds between North and South were at their peak. Lincoln was assassinated five days later. Had the South undertaken guerrilla warfare, it’s more than likely the U.S. would have broken up into two countries. At Appomattox, Lincoln and Grant gave generous terms to the South, paving the way to reconciliation. But they found a willing partner in Lee. Neither a citizen of the Union he once loved nor of the Confederacy that ceased to exist, Lee publicly rejected the idea of a guerrilla struggle. Most important, by April 1865 he no longer spoke of the Confederacy as “we” or “our country.” Now he spoke as a U.S. citizen, thereby forging the path to a reunited country. For this reason when there were cries to try Lee for treason, Grant vigorously opposed them. The debate will surely continue over whether to move the Confederate monuments out of public view, as it will over whether to rechristen spaces bearing the names of Jefferson, Andrew Jackson, Woodrow Wilson and even Washington. Where will it end? Robert E. Lee’s story should serve as a reminder that the past is more nuanced and complex than the current political debate suggests. It is important to take public sentiment into account, but not at the expense of ignoring or perverting history. Mr. Winik is author of “April 1865” and “1944” and historian-in-residence at the Council on Foreign Relations.